Gene Link Oligo Synthesis Division is not an "oligo factory". Order Gene Link Oligos for demanding applications and consistent results. Gene Link oligos will not fail due to quality reasons. Each oligo is meticulously monitored during synthesis for coupling efficiency and after processing by polyacrylamide gel electrophoresis. 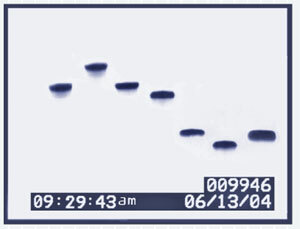 A Gel picture is supplied with each oligo. New Customers buy one, get one free. Any size up to 250 mer of unmodified DNA oligo. All Gene Link synthesized custom oligonucleotides are supplied desalted, lyophilized and ready to use after reconstruction. The oligonucleotides are synthesized on state of the art computer controlled DNA synthesizers. The "crude" desalted ethanol precipitated product is suitable for most PCR** amplification, Short Tandem Repeat Polymorphism (STRP) repeat analysis for gene mapping and sequencing experiments. 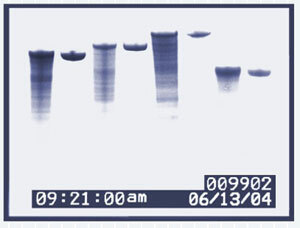 An actual gel picture of quality assurance polyacrylamide gel electrophoresis and technical information e.g. Tm, mw, base composition and the exact A 260 units supplied.